Nov. 24, 2017 3:32 p.m.
An increasingly notorious homeless camp in the Chilliwack River Valley may soon be dismantled and cleaned up. 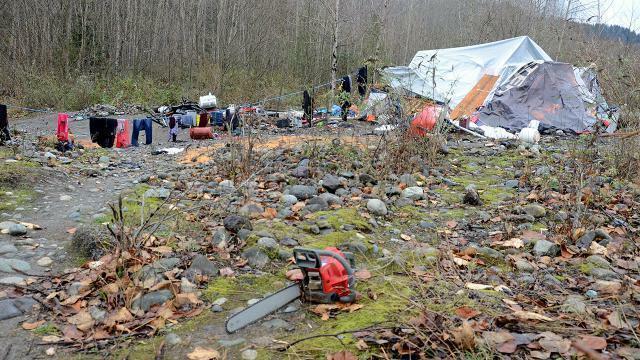 The sprawling camp near Teskey Rock just up-river from the Vedder Bridge is littered with syringes, garbage and various tools and household items many neighbours say have been stolen from homes in the area. “You can plainly see all these stolen items from the road, stolen from the people of Chilliwack,” said resident James McGillivary. The Progress visited the site on Friday and again on Monday. The site is littered with bikes and bike parts, backyard tools, electronic items, clothing, even DVDs, sports equipment and lots of garbage, including syringes. McGillivary is a sports fisherman who said he has had several run-ins with individuals in the camp. It started when he left his vehicle overnight at a pub after a few drinks. The next morning he found his window smashed and items stolen. Not one to sit on his hands and just call the police, McGillivary went looking. He saw video footage of the break-in with a young man on a distinctive bike. He started asking people on the streets who the guys were and eventually someone directed him to the camp about 500 metres up from the Vedder Bridge. He later sat and watched the encampment for hours on end to see what was up. McGillivary is frustrated police have not gone in to seize stolen items and arrest those who are involved with what he calls an organized theft ring. The camp has been there for months, at least since another nearby camp was dismantled in March. There, officials removed more than 17,000 pounds of garbage and hundreds of syringes. McGillivary’s first interest in the new camp, one that sparked confrontations with campers, was over the thefts from nearby sports fishers and residents in Vedder Crossing and Promontory. But the environmental mess is what has him really angry now. That was before last week’s heavy rain. McGillivary went down again on Nov. 23 at the water’s peak and he estimated half of the garbage and material on the site was already under water or washed away. By Nov. 24, much of that water had receded, but how much washed away is impossible to know. McGillivary is baffled the site had not been cleaned up before the rains came given the amount of mess and that the river rises every November. He has met with MP Mark Strahl, Mayor Sharon Gaetz, MLA Laurie Throness, RCMP Insp. Davy Lee, none of whom gave him any satisfaction. The jurisdictional issues over the site are complicated. McGillivary complains that the city hasn’t responded, but Gaetz has pointed out the area is Crown land so a provincial responsibility. There is also a no-trespassing sign on the land that says it belongs to the Soowahlie First Nation. Then there have been the visits from officers for Fisheries and Oceans Canada (DFO) and the B.C. Conservation Officer Service (BCOS). A spokesperson for the Ministry of Forests, Lands, Natural Resource Operations and Rural Development’s Compliance and Enforcement Branch told The Progress last week enforcement is coming. He said by the end of last week or early this week, those in the camp were to be given a seven to 14-day timeline to vacate the site with all their possessions. By Monday, the camp was still fully intact. After that, Land Act seizure notices will be served on anyone left, and RCMP, BCOS officers and others “participating in this project” will move in to clean up. As for McGillivary, he’s relieved to finally hear something will be done, but given the high water last week, he said it’s too little too late.